We wish all students Good Luck for Future Studies! 2017 past Paper still consider as a secret document, hence it can be download / printed only after a certain date given by Exam Commissioner. Cut Off Marks for Popular School will be release 2017 December according to the sources. • 2017 Paper can be printed only after a certain date given by EC. Sri Lankan Examination Department says that (පස්වන ශ්‍රේණියේ ශිෂ්‍යත්ව විභාගය විභාගය Scholarship Exam 2016) 2016 Grade Five /Year Five Scholarship examination Results has been released. Exam was held August 21 Sunday. At the moment www.doenets.lk Web site is very slow due to Heavy Traffic. So better get Your Results via SMS. At the moment Web site is very slow due to High Traffic. So better get it via SMS. Ruvanya Methmini Gunasekara of Kuliyapitiya Aswedduma Subharathie Vidyalaya becomes 1st Place in Grade 5 Scholarship Exam with 195 marks. Tamil Medium island first Gokulanadan Abhishikan - Rambekulam Maha Vidyalaya - Vavuniya with 195 marks. Exam Department said that Re-correction Applications should be sent before November 4 through the principal. 2016 Paper can be printed only after a certain date given by the Examination Commissioner. Your Children May be you pass, may be disqualified, Dont Worry. Dont blame him/her. Give courage to him, give a small gift to him/her to courage for future studies. Warmly Wishes, All the Very Best and Good Luck for Future Studies those who are Pass Grade 5 Scholarship Examinations in 2016!!! We wish all other students Good Luck for Future Studies! 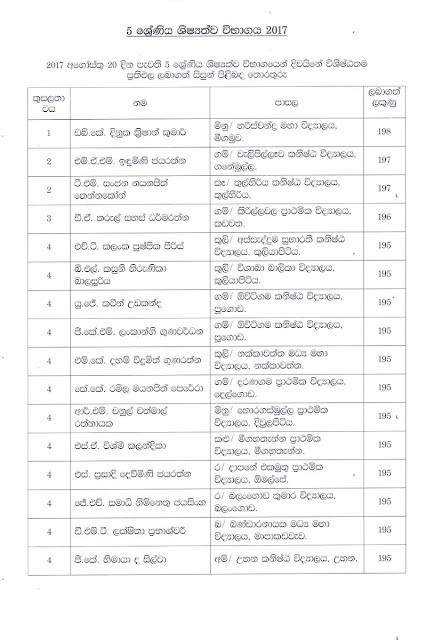 2015 Grade 5 Scholarship examination (ශිෂ්‍යත්ව විභාගය - Paha Shreniya Shishathwa Wibagaya) Results relesed now. Pass mark is 160. Hambantota & Ratnapura Districts Pass mark is 158 for Sinhala Medium. Anuradhapura & Polonnaruwa Districts Pass Mark is 156. Monaragala Pass mark is 155. 2015 Paper can be printed only after a certain date given by the Examination Commissioner. 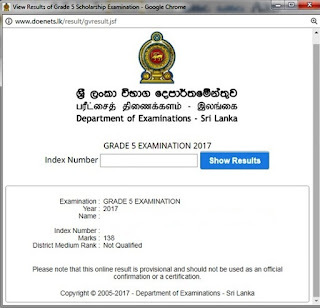 Sri Lanka Examinations Department has scheduled to release the results of the Grade Five scholarship examination - 2014 at the end of this month to www.doenets.lk web site. Grade five scholarship examination (Paha Wasara Shishshathwa Prathipala) - 2014 was held on August 17 and more than 300,000 candidates sat the examination. The Commissioner General of Examinations W.M.N.J. Pushpakumara, has confirmed that the evaluation of the answer-scripts of the candidates who sat the examination has been finalised. "Lanka University News" has published a detail of results releasing dates of early years.